Climb, Slip, Slide, and Make A Splash With This GIANT Water Slide! You won't believe your eyes when you see this giant 27' tall double lane water slide! This fun tiki theme sets the summer mood with multiple rows of palm trees and that familiar blue beachy vibe. This steep water slide is perfect for the thrill seekers out there! The fun doesn't stop at the slide, though! Once you slide down, a giant slip and slide awaits, which leads into a 12 in deep slide pool. 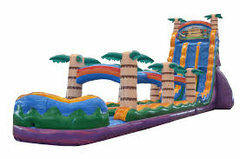 This thrill-filled slide is the perfect accent to any summeer party, call to book today!